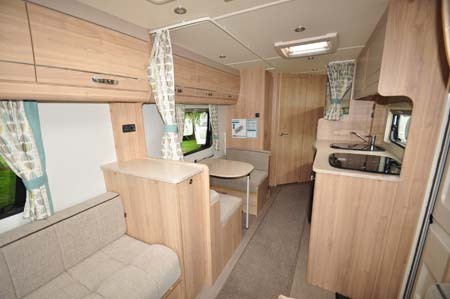 A great family-friendly caravan that will also appeal to your pocket? You don’t need to look much further than the top of the Xplore range from Elddis, where there are two six-berth contenders. 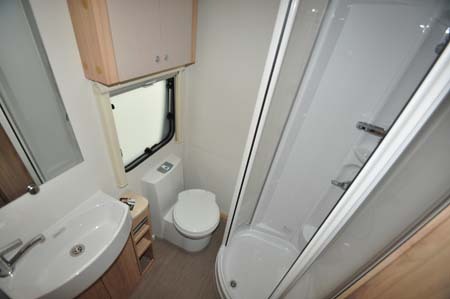 This, the slightly pricier 586 – the similarly bunk bedded 526 is £200 less – majors on a bigger washroom at the back, whilst also extending Elddis’s claims to offering more family layouts than any other manufacturer. 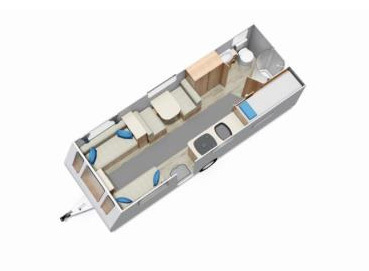 There are still plenty of six-berth rivals at this price level, but none can match the Xplore 586’s floorplan, which was brand new for this season. From the outside, the presence of those two windows towards the back is the key indicator of bunk beds inside. All the virtues of Elddis’s SoLiD bodywork construction are here, too – aluminium sides, fully-bonded roof, bonded awning rails, etc – all backed by a 10-year water ingress warranty. It even includes a GRP underskin to protect the floor. Graphics are fairly discreet and that single front window and stable-type door are the main indications that here is a ‘van that majors on price. What you do get in this floorplan is a genuine feeling of space. That’s largely thanks to pushing the washroom to the rear offside corner, next to the lengthways bunks along the nearside. Doubtless, the particularly light finish to the furniture also helps in this respect. Even if there are less than six of you, this is a handy arrangement. Kids will always love bunk beds on caravans, and that side dinette will always come into its own as a seating/dining area for two. 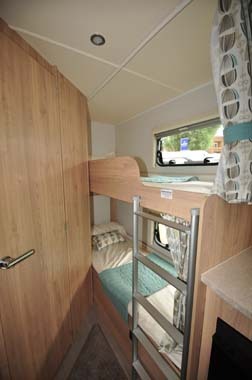 Of course, it can convert into bunks, too – in time-honoured fashion – but you also get the bonus of a memory foam roll-up mattress addition for the upper bunk. Curtains provide some privacy for the bunk areas. Meanwhile, at the front, pull-out slats help complete a large 1.99m x 1.28m transverse double. Actually, those front settees are long enough to be used as single beds. The unit between the two main seating areas is low enough level to provide a platform for a TV. It also houses a dedicated locker for the main table, making it easy to hand from the lounge. 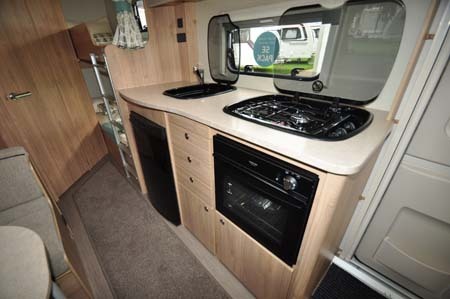 The kitchen is mid-‘van nearside and sees a three-ring hob and separate sink in matching black finish, as have the oven/grill and the Dometic fridge – the latter an 8 series model so you have the extra flexibility of being able to remove the freezer box altogether if you just want larder space. Crucially, there’s some space for changing in the washroom. 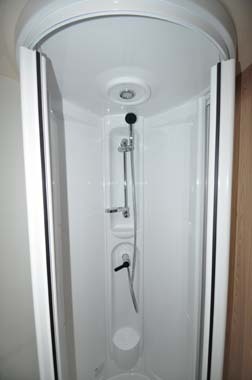 A part-circular shower cubicle is tucked away on the right-hand side, with the swivel-bowl toilet taking the opposite corner. The window beyond the toilet will prove a boon for ventilation, whiles there’s a good variety of storage – lockers and open shelving – around the corner basin. Just the one towel holder is a missed trick, though. Heating and hot water are courtesy of Whale – there’s an eight-litre water tank and the heater unit itself is a space-saving design. Critically, its operation is quiet and the thermostat is consistent, for those who like to leave their heating on through the night. As you’d expect with a budget model, there are plenty of opportunities for upgrades. The SE Pack – comprising Al-Ko AKS stabiliser, alloy wheels, steel spare wheel and carrier, stereo with MP3 connectivity – at £420 could be considered an essential. Likewise, there are plenty of opportunities to add safety and security – Al-Ko’s ATC is surely going to be a priority – and indeed, may recoup some of the outlay by qualifying for discounts that reduce your insurance premium. Just bear in mind your timings at around this time of year (June). Dealers’ stock of all new caravans will be running low, in preparation for 2017. But, that might also mean you can pick up an end-of-season bargain! 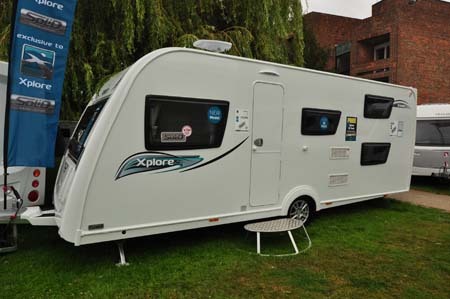 There’s more information on the Xplore range on the Elddis website. 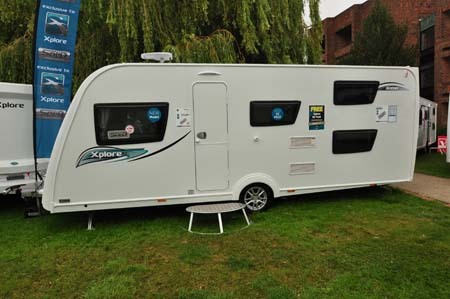 To find out more about insuring this or your current caravan visit our caravan insurance discounts page. 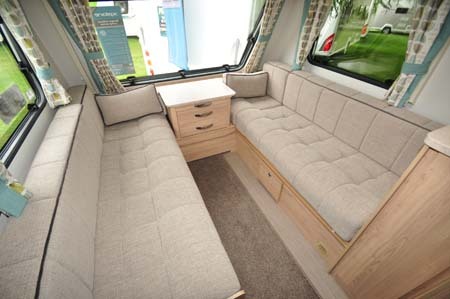 *Caravan insurance based on Elddis Xplore 586 caravan retailing at £15,894 fitted with hitchlock and optional axle wheel lock. Kept on drive at HX4 0BE. 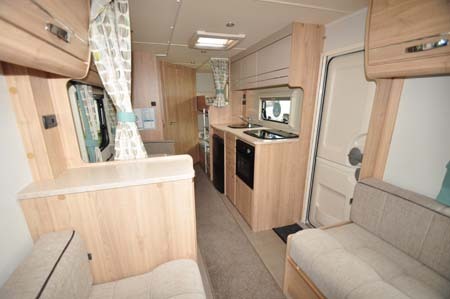 Caravanners over 30 years old, claim free for 3 years and a member of a caravanning club. £100 excess. 180 days European cover and up to £75 per day for up to 15 days emergency accommodation cover included. Legal expenses cover, extended European cover and other emergency accommodation expenses cover options are available at extra cost. Quote includes 10% online discount and 9.5% Insurance Premium Tax and is correct as of 7.6.16.